Ok, maybe someone can explain that weird pocket to me? It looks like there is an extra strip of blue material and three gold bumps on it. In any case, this is a broad purple plaid with one breast pocket that does up with snaps. In Fresh Blood (3x07), Sam wears it from when they go try to track down the vampire that is tricking girls into drinking his blood until Gordon is dead. Sam wears it when he goes on his suicide run against Lilith during the summer of 2008, as we see in flashbacks during I Know What You Did Last Summer (4x09). In Jump The Shark (4x19), Sam wears it from when he takes Adam shooting until the ghouls strip it off him. Sam wears it in all his scenes in The End (5x04) (obviously not the scenes where he is Lucifer though). 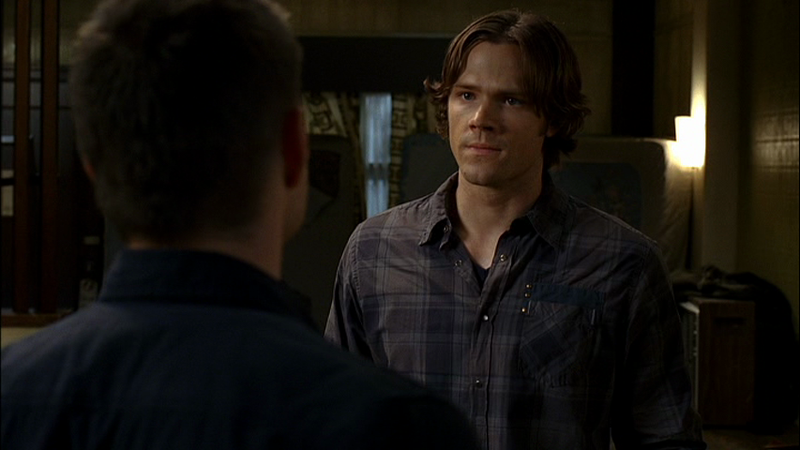 In Changing Channels (5x08), Sam is wearing this shirt when he is returned to his normal state after being the Impala. He keeps it on for the rest of the episode. In Two and a Half Men (6x02), this might be the shirt that Sam is wearing when he is sitting on the park bench and Samuel calls him back about the security company. He wears it until Dean meets up with him at night to look at the baby that Sam found. In Clip Show (8x22), Sam wears this shirt when they get back from visiting the priest in St. Louis until the end of the episode. FATE: It gets a bit bloodstained when Sam kills Gordon.